The Anchor Man Trailer is the right tool for the job! It allows the rescuer to move heavy loads over great distances with minor effort or fatigue. The rescuer arrives at the scene of the accident without requiring a rest period before starting to perform the rescue. The trailer disassembles compactly for ease of storage and can be reassembled in a matter of 3 minutes. 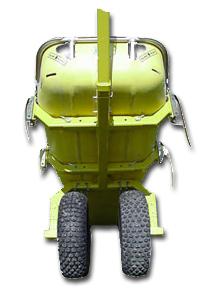 The trailer is outfitted with ATV wheels and hubs to resist punctures and provide traction, the tires filled to low pressure to assist suspension already provided with the Yellow Jacket Basket Litter, and to provide a very comfortable ride. The weight of the wheels and hubs provides a lower center of gravity, making it far less apt to tip, even when the wheels are assembled on the inside of the frame. The Anchor Man Trailer may be assembled with the wheels attached either inside or outside the frame, allowing the trailer to fit through narrow areas when required. The Tee Handle allows all rescuers to face forward and push a load, without twisting and possibly straining in order to maintain control. All of the weight of the load is balanced over the wheels at a comfortable carrying height. Four heavy clamps with hooks allow the Yellow Jacket Basket Litter to be easily attached to the Anchor Man Trailer in seconds. The Anchor ManTrailer is powder coated with nylon to protect skin contact in extreme cold temperatures and to provide maximum durability. Reflective tape helps to illuminate the trailer at night. Skis may be substituted for the wheels, which will maximize the usability of the Anchor Man Trailer. We recommend if this unit is going to be towed by anything but people power that the ATV kit is used. This ATV kit consists of : 2 wheel strut stabilizers, 2 wheel fenders, 1 ATV hitch with 1 7/8 ball receive, safety chains, and all applicable nuts, bolts and washers to assemble the unit. At the time power is added we recommend that this unit be bolted together.